Users generally migrate from one client to another due to advance features and simplicity. Outlook has been in the glare of publicity due to this reason only. A number of users migrate from other clients to MS Outlook because of its features and simplicity. For the migration of various items, a number of tools are available. 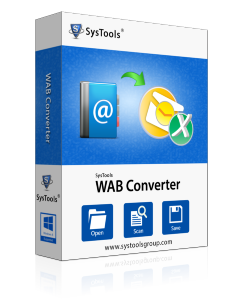 Windows Contacts Converter is a trustworthy solution that enables users to transfer contacts from Windows Address Book to Outlook and Excel formats without any hassle. The software is efficient enough to perform swift migration of contacts in few mouse clicks. It swiftly migrate entire Windows contacts to Outlook and Excel format without any chances of loss of contacts. The software is efficient enough to perform swift migration in few mouse clicks. If the users are hurdled in any step, technical experts provide efficient solution to get rid of it. The tool generates a preview of Windows contacts on loading the file to it. Attributes associated with contacts like personal, business and other information can be viewed in the software panel. Any modifications in the contacts can be done with ease. The tool is built with simple and easy to use interface via which both tech savvy as well as an ordinary user convert Windows contacts to Excel and Outlook without any help. It is provided with single panel interface to rescue users from migration to multiple windows. Why Should User Go with Windows Contacts Conversion Tool? Is there any solution to save contacts from Outlook Express to MS Outlook? What is the format of PST files created by the tool? On converting windows contacts to outlook PST format, the software allows users to create PST files of either ANSI or Unicode format. The resultant PST file can be easily opened with Outlook. Is there any chance of losing contacts while performing the conversion using Windows contacts converter? How many Windows contacts files can be added to the software at a time? HUsers can add only one contact file of Windows at one go. However, the tool has caliber to convert any number of Windows contacts to Excel and Outlook one by one. How can I save the resultant files generated by the tool? You can save the resultant file at the desired location according to your convenience. The tool allows users to create a new folder to save the resultant file from its panel.